Yes, you can camp in Venice! 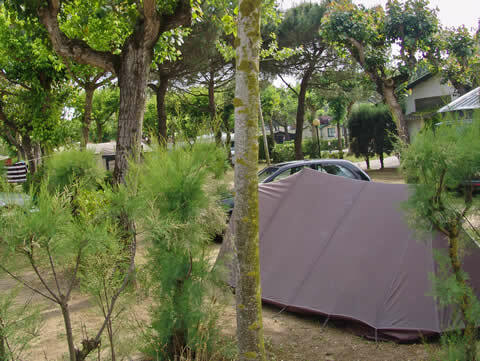 Or at least, you can camp on Punta Sabbioni, one of the long barrier islands between the open Adriatic Sea and the Venetian lagoon (like the famous Lido—in fact, it's the next one up from the Lido in the chain of islands). It's actually quite a nice little seaside campground. You can sit out on the beach across the road and watch the sunsets, and there's a decent pizzeria-bar and an Internet point. There are also free bikes for guest use, a free shuttle to the beach, and a free ferry shuttle to the Piazzale on Punta Sabbioni (or a ten-minute walk) from whence you can catch a vaporetto ferry to downtown Venice in about 40 minutes, or out to Burano and the other outlying islands. 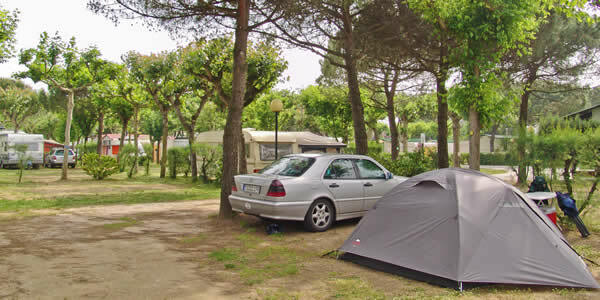 The campground offers both tent and campervan sites (from €21.50 to €36 for two) and bungalows (€32 to €78 for up to four or five people, with a 3-4 night minimum stay, depending on season). It stays open from early April (or the weekend before Easter) through the first Sunday in November.